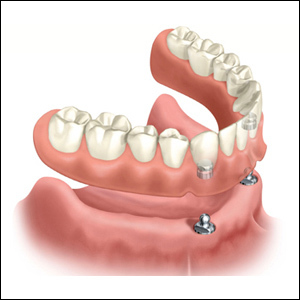 Dental implant Overdenture - Dental Implants Dominican Republic S.Q.D. Dental implant Overdenture - Dental Implants Dominican Republic S.Q.D. The prosthetic implant is an alternative to conventional full dentures. The oral rehabilitation with osseointegrated implants is a therapy that can be used in different situations with high success rate, and well documented scientific evidence. While conventional full dentures can meet the needs of many individuals, other patients want better retention, stability, function and aesthetics, especially for the lower jaw. Patients who want to increase the retention of total prosthesis. Patients who do not want a fixed prosthesis. Patients have difficulty performing oral hygiene impossible for a fixed prosthesis. Low cost in comparison with fixed prostheses. The prosthetic implant installations modified diets, improve nutritional status, and has impact on the overall health of people.The overdenture provides the ability to chew efficiently variety of foods.